Through participation in the Alumni Association, Ranken graduates have many benefits and opportunities to aid their personal growth through networking, while also impacting the growth and future of Ranken students. Membership in the Alumni Association is free and automatic for anyone who has completed any Ranken program. The Alumni Association hosts networking opportunities, educational programs and off-campus activities to keep alumni connected to each other and up-to-date with industry trends. As an alumnus, you are forever part of the Ranken family of graduates and welcome to visit campus at any time. Contact the office of Alumni Relations for more information by calling (314) 286-4895 or emailing [email protected]. 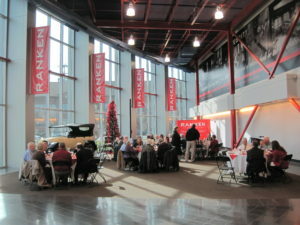 The Ranken Technical College Alumni Association is committed to supporting the interests of Ranken Technical College, its alumni, and its current and future students through the development of mutually beneficial relationships in a lifelong affiliation that will enhance the image, quality, and reputation of the College in the spirit of unity and loyalty. While most of our graduates reside in Missouri (61%) and Illinois (32%), Ranken alumni are spread out throughout the country making their homes in 49 of the 50 states. Since adding Walker Hall and Residential Life, as well as our rapidly-growing new location in Wentzville, we expect these numbers to grow each year. Ranken graduates are the backbone of St. Louis’ cutting-edge technical workforce, from architecture to automotive, to carpentry, maintenance and plumbing. If it was designed, built or installed in St. Louis, a Ranken graduate was probably involved in the process. Read stories of our successful alumni who have chosen to share their paths to success hoping to provide motivation and inspiration to others. The Alumni Directory helps you keep in touch with others from your graduating class with a listing of current Ranken alumni contact information. The directory is updated every five years, and the most recent one became available in 2013. Contact the Alumni Relations office to order a copy of the 2013 Alumni Directory. Call (314) 286-4895 or email [email protected]. The Alumni Association is governed by the Alumni Leadership Council, a voluntary council formed to provide leadership to the College’s 17,000+ alumni. This Council is responsible for advice and insight as to what services and activities are desired by Ranken graduates. The time commitment is minimal, but the effect is long-lasting as well as helpful in planning, and important in implementing programs to meet all graduates interests and needs.